Have You Been Having Trouble Remembering Things? Does Alzheimer's Run in Your Family? Judy was terrified - and she had good reason to be. …Until she didn't even know who Judy was anymore. …Doesn't Alzheimer's run in families? Would Judy herself someday forget the names and faces of her loved ones - and become unable to do even the simplest things for herself? Judy was only 48 years old, but her memory was already starting to slip. She was losing her keys way too often… entering rooms and then forgetting why she was there… and blanking out on people's names. Was she already experiencing the early signs of Alzheimer's? Perhaps you're experiencing the same thing. You may have seen loved ones lose their minds and their freedom to Alzheimer's disease or dementia. Or perhaps you've been noticing problems with your own memory. …Even if both your grandfather and your mother had Alzheimer's disease, you are NOT automatically predestined to lose your most precious memories and live out your days in a nursing home like they did. There are safe, natural things you can do to protect your mind from future decline - and even improve your memory. But you probably won't hear about them from your doctor. And many more ways to treat and prevent memory decline! No more worrying about becoming a burden to your children and grandchildren. No more stressing over how you're going to pay for long-term care in a nursing home. You'll get the treatment plans I've been using to help my patients protect their brains from cognitive decline… recover youthful, razor-sharp memories… and delay (or even reverse) the progression of Alzheimer's disease. And now, for a limited time, you can download Never Get Alzheimer's! for only $4.95 - which is less than you'll pay for a sandwich at the local deli. So why wait another moment? 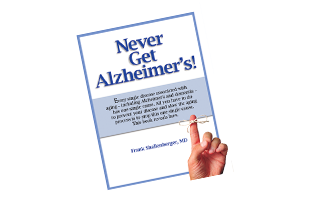 Get your copy of Never Get Alzheimer's! today - and get the information you need to experience a sharp mind and healthy memory well into your Golden Years. Your satisfaction is guaranteed! If you are unhappy with Never Get Alzheimer's! for any reason, contact our Customer Service Department within 90 days of purchase and you’ll get a full refund of every penny you paid. You can’t lose!